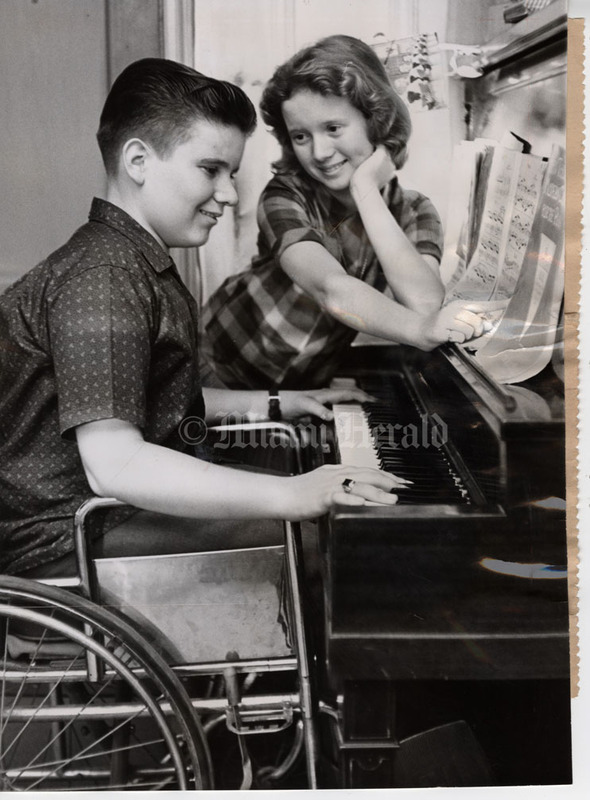 4/29/1959: Herald Staff Photo by Bob East -- Johnny plays for sister, Joan; he couldn't get vaccine. Football and baseball were the dreams of Johnny Huddleston before polio put him in a wheelchair five years ago. There wasn't any Salk vaccine then. Johnny's sister Joan, 11, stricken at the same time, made a quick and full recovery. But Johnny, 14 now, is still in his wheelchair with both legs paralyzed. The Strike Out Polio campaign ended the second week of a month-long drive to give Salk shots to every Dade Countian. County health clinics will be open Friday for the second week in a row to provide free shots to those unable to pay for them. 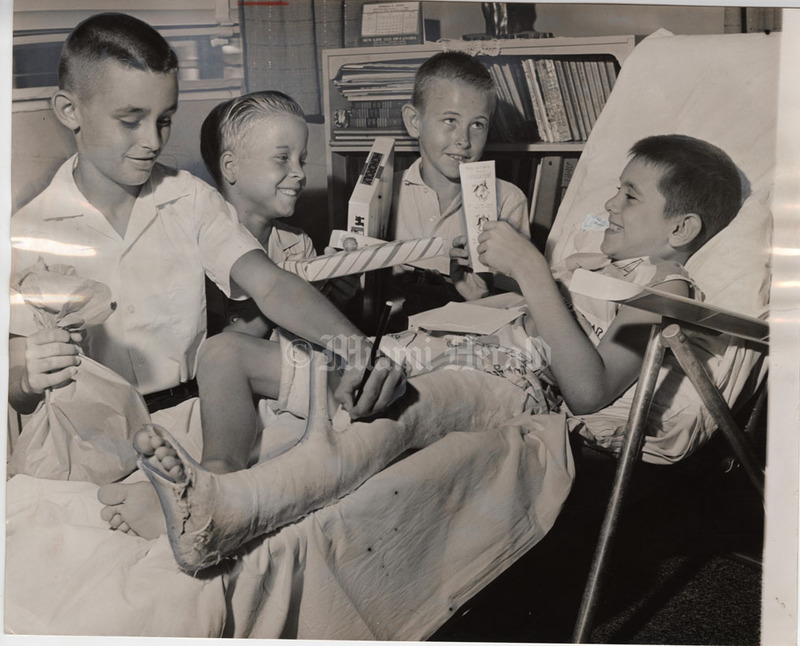 8/16/1961: Herald Staff Photo by Doug Kennedy -- Happy Time. Life of the party given for him by his Sunday school class this week was Michael Nealey, nine, of Hialeah. It was sort of a "pre-coming out party" for Mickey who will get rid of the cast for his polio-stricken leg in a couple of weeks. He has been a faithful member of the North Hialeah Baptist Church, even though he has been crippled since he was two years old, until his latest operation in June kept him home. Billy Hicks, Kenneth Blizzard and Jack Thompson assure him they've missed the laugh and spirit he always added to the class. 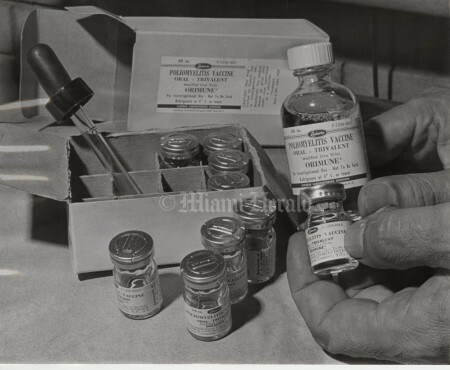 7/24/1959: Lewis McLain/Miami Herald Staff -- Dade's supply of free polio vaccine melted to zero Friday before an onslaught of 3,283 shot-conscious Miamians. At the South clinic, 955 shots had been given at 3:30 p.m. and the line still wound around building with more coming. 7/24/1959: Lewis McLain/Miami Herald Staff -- (BACK OF PHOTO) Dade's supply of free polio vaccine melted to zero Friday before an onslaught of 3,283 shot-conscious Miamians. At the South clinic, 955 shots had been given at 3:30 p.m. and the line still wound around building with more coming. 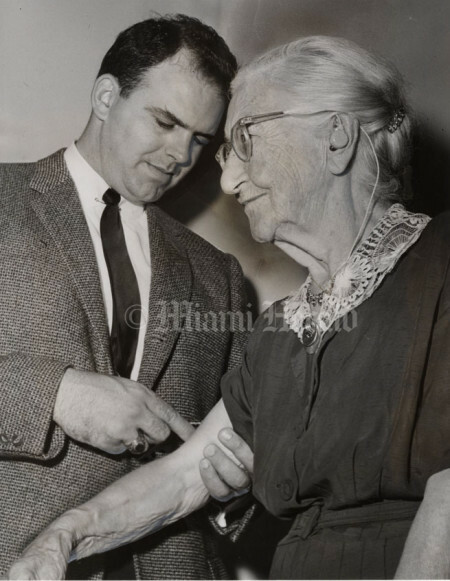 7/23/1959: Lewis McLain/Miami Herald Staff -- Louise Hutton getting ready to give polio shots tomorrow. 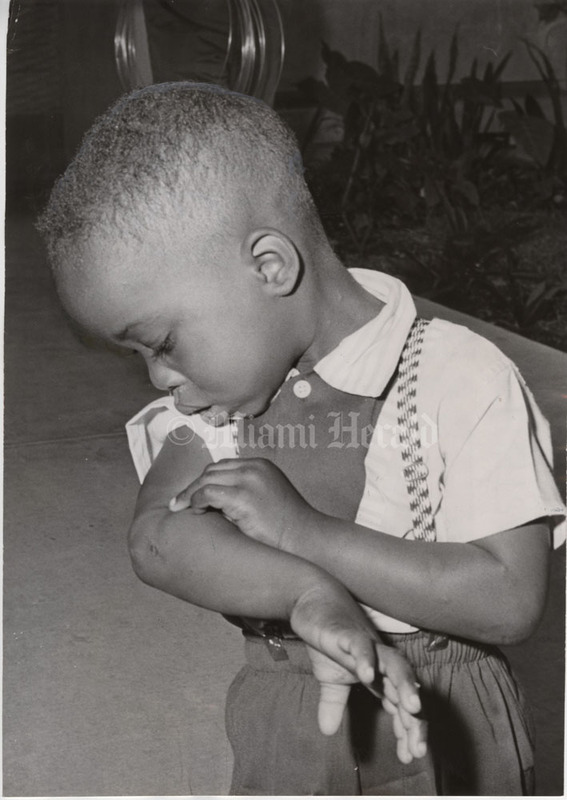 4/23/1959: Lewis McLain/Miami Herald Staff -- Dwellie Riley, 4, inspects the damage. 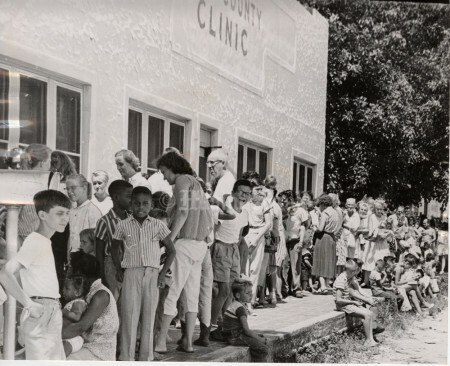 Faced with the 10th case of polio in Dade in 1959, county officials will offer free vaccine shots at six sites today. The offers of free shots wind up the first week of Dade's month-long "Strike Out Polio" campaign. 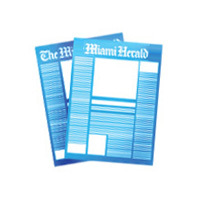 Shots were given Thursday at Florial Elementary School. 4/17/1962: Ron Wahl/Miami Herald Staff -- Little Roderick Brown gulps quickly. Nurse May Dean holds polio vaccine cup. 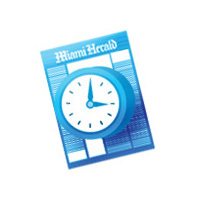 The Dade County booster program to keep polio at bay accelerated slightly Tuesday. 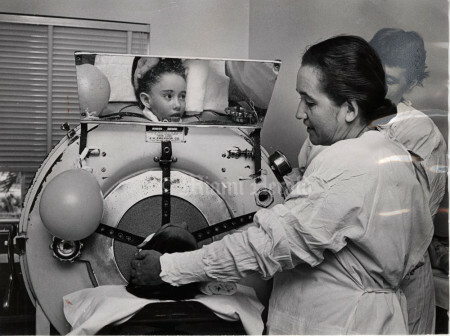 Thirty infants between 9 and 23 months of age were given the Sabin oral vaccine. 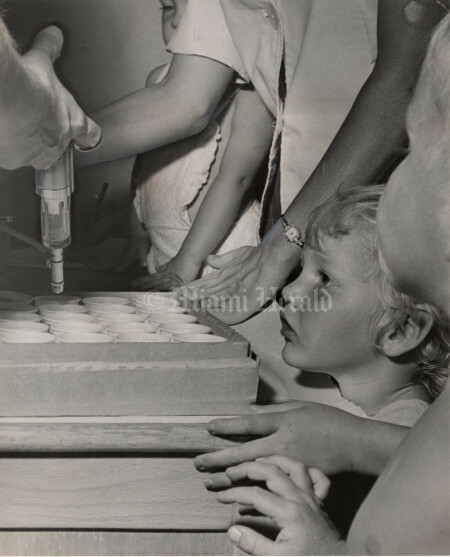 2/15/1960: Lewis McLain/Miami Herald Staff -- Andy Rice, one year old, of 9360 SW 80th Ave., gets polio vaccine at the Public Health Clinic, 5798 SW 68th St.
2/9/1960, Miami Herald Staff -- Vaccine boxes are stacked and ready. Dr. Lewis B. Clayton and Mrs. Zola McWilliams peer over tops. 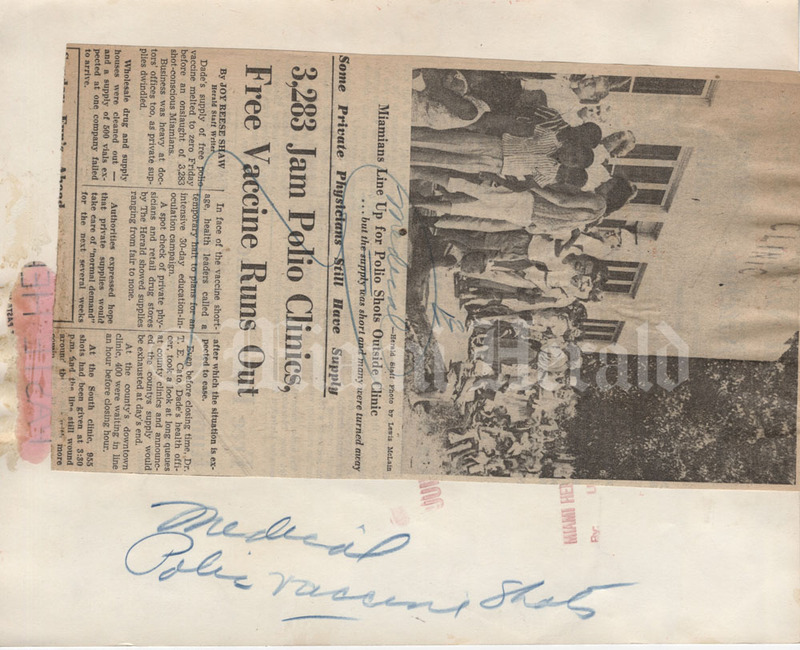 Preparations for V-P Day, (Vanquish Polio) launching America's most ambitious community effort to wipe out polio through the new oral vaccine, are being rushed to completion. 1/11/1960: Mike Freeman/Miami Herald Staff -- Just a sip is all it takes of this Cox vaccine to immunize a person from polio, doctors believe. 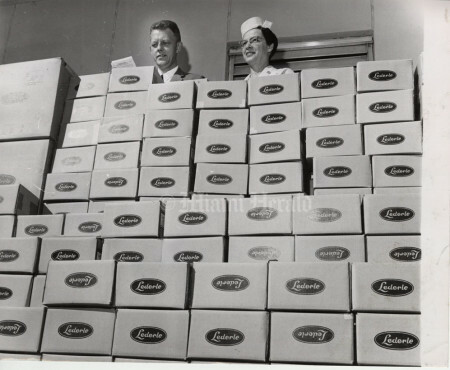 This first shipment of the cherry-flavored oral vaccine was turned over to Dade polio fighters Monday by Lederle Laboratories, Inc., where Dr. Herald Cox developed it. The vaccine will be used in a test program involving thousands of Dade Countians, beginning Feb. 3. The goal: wipe out polio completely here. 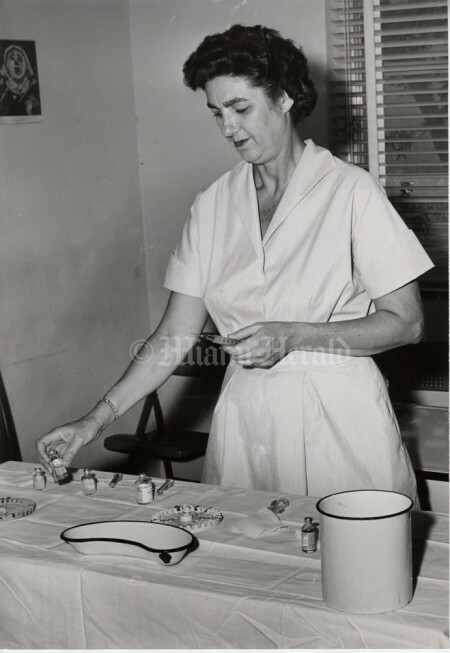 On dose of the vaccine is equal to about a half-teaspoonful. 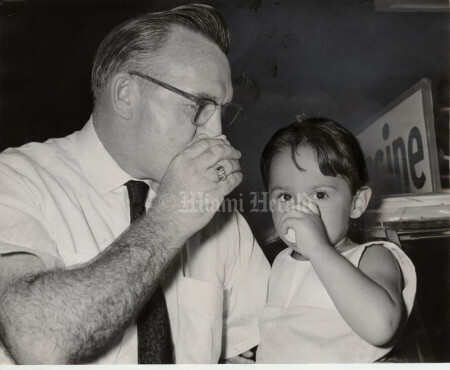 4/30/1960: Bill Kuenzel/Miami Herald Staff -- Down the hatch for father-daughter sippers. 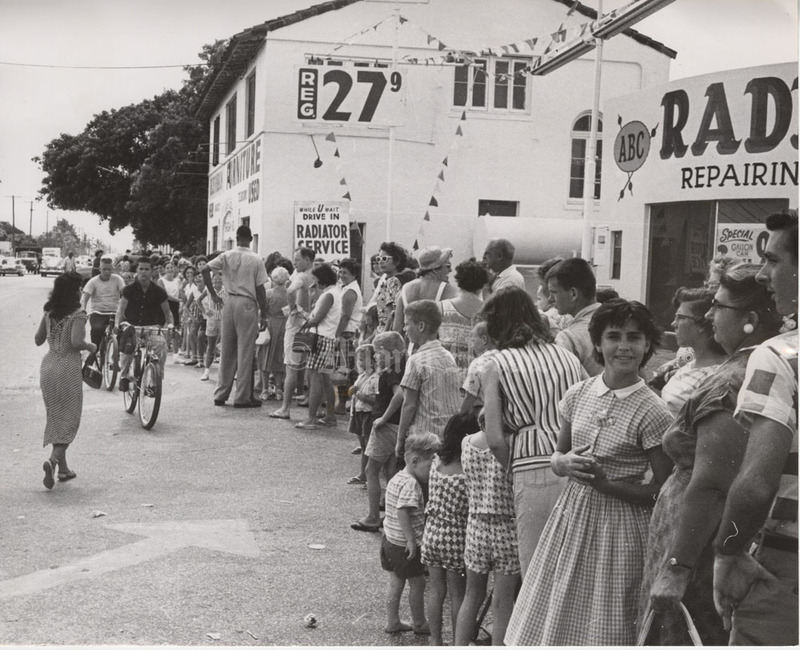 Joe Kline and Candy, 3, of 2385 Flamingo Dr., Miami Beach. Dade County drained the last drop of Cox oral polio vaccine Saturday at 8 p.m., winding up a community-wide program launched two and a half months ago. 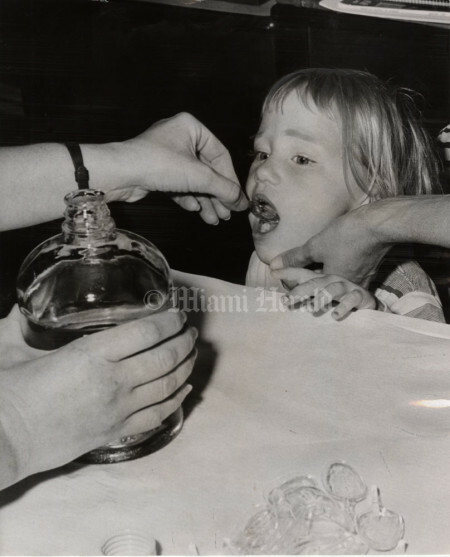 3/17/1960: Doug Kennedy/Miami Herald Staff -- Two dips please! Wide-eyed Sally Ann Barnes, 3, closely supervises the filling of polio shot cups at Kingston Park Elementary School. She and thousands of other Dade youngsters have already taken their cupful of Cox oral vaccine in the county's mass immunization test. All residents under 40 are asked to take the cherry flavored vaccine. 2/15/1960: Lewis McLain/Miami Herald Staff -- A sip in 1960. 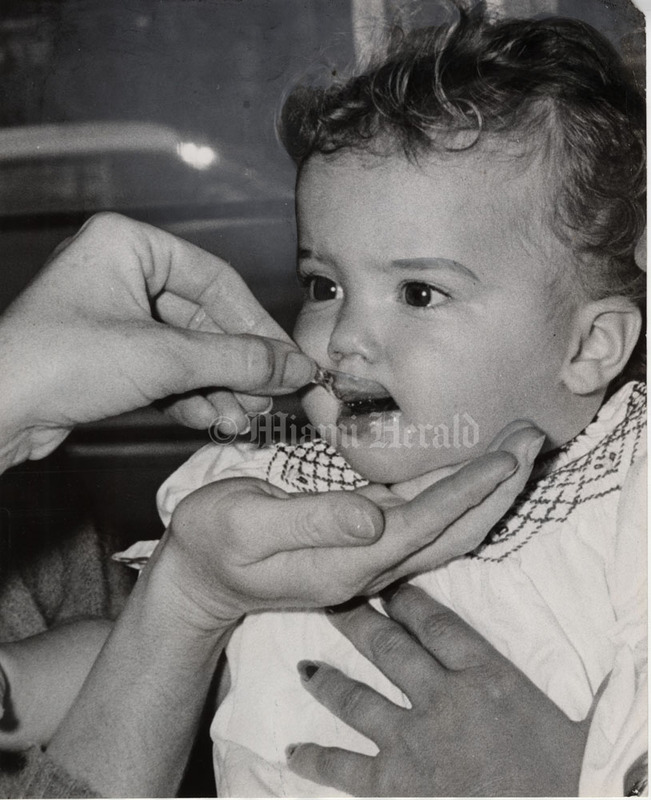 Deborah Frank, 3, getting polio vaccine at Public Health Clinic, 5798 SW 68th St.
5/2/1962: John Walther/Herald Staff Photo -- No, thanks. 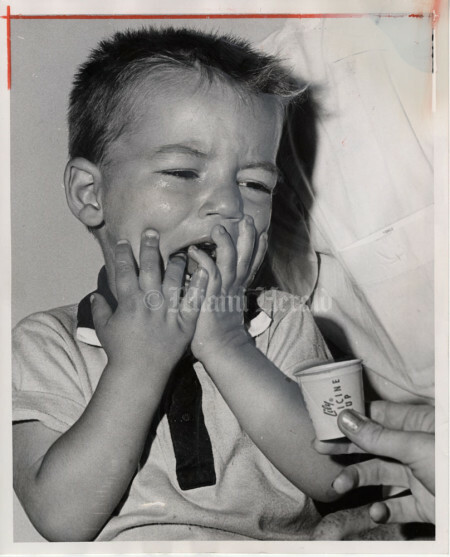 Little Anthony Azara is more than a little dubious about taking a sip of the Sabin oral vaccine at the county clinic. But the 20-month-old child gave in and joined 83 other Dade children who drank the vaccine Wednesday. Today is the last day it will be given away free. 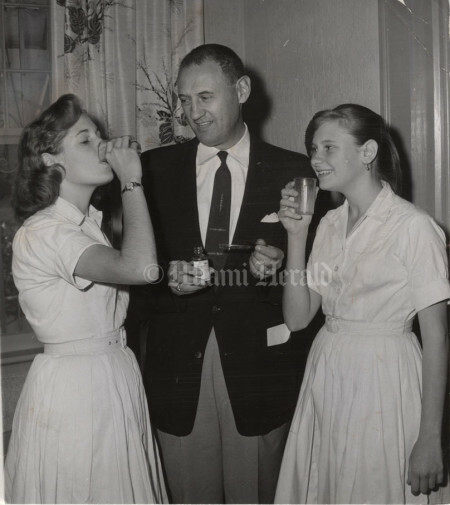 2/2/1960: Lewis McLain/Miami Herald Staff Photo -- Barbara Evans, 15; Jane Evans, 14, receive polio vaccine from Dr. Evans. 2/2/1957: Doug Kennedy/Miami Herald Staff -- Smart for her years. 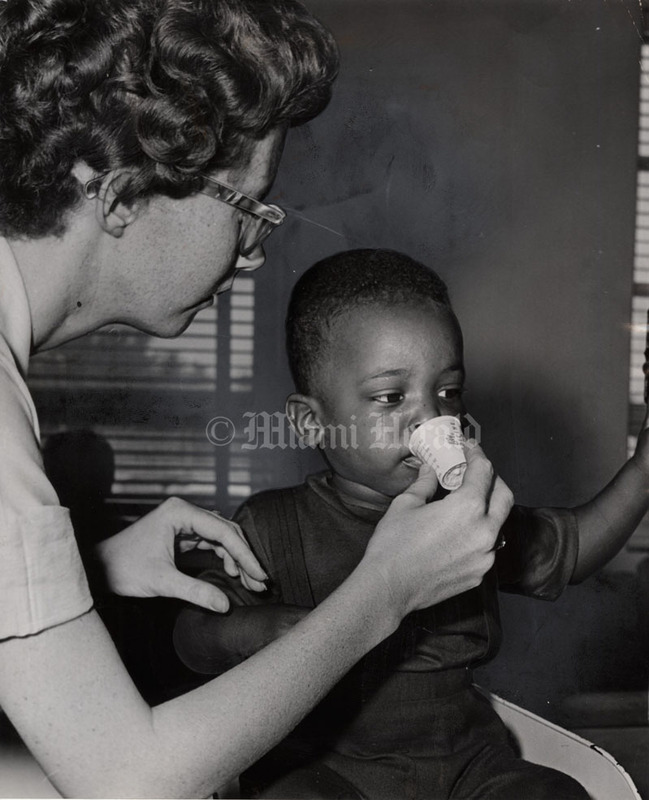 Mrs. Hugh A. Ellis, 89, of 6880 SW 52nd St., has taken the All-Out-All-Ages drive on polio so seriously that she went to her doctor to demand a Salk shot. When he suggested that at her age she probably didn't need it, Mrs. Ellis protested: "It's my patriotic duty. Besides, wouldn't you feel silly if I didn't take a shot and then got polio?" As the picture shows, Dr. G.B. Paxton bowed to the will of a strong-willed woman. 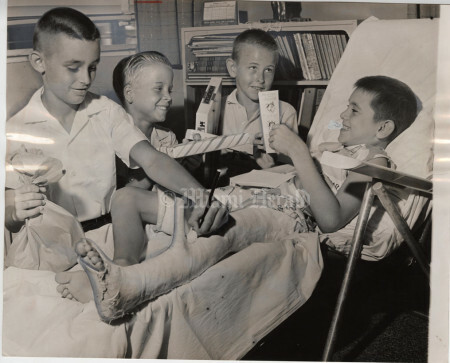 7/23/1959, Miami Herald Staff -- No tears, Dad. Frank Kellert Jr. looks on with glee as Marlin first baseman Frank Kellert gets polio shot from Dr. Ralph Ferguson. 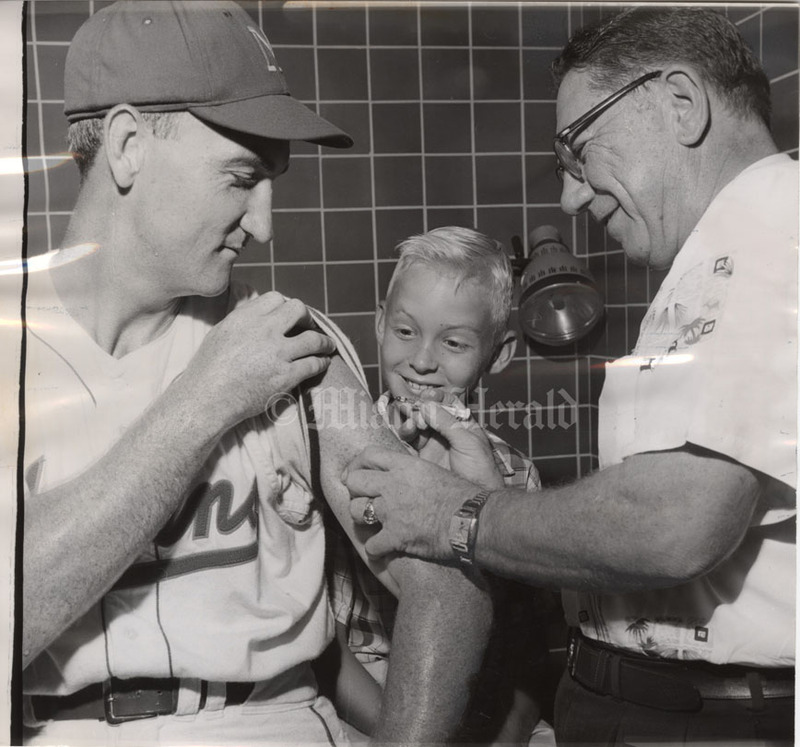 Many Marlins took advantage of the free Salk shots Friday at the stadium. The elder Kellert had his first two shots over eight months ago. Now he has to take two more shots to catch up, the regular third shot and a booster. His son has had all three. 9/29/1962: Albert Coya/Miami Herald Staff -- Gloria Ramos in iron lung, with her worried mother, Ann Flores Ramos. Dade's first case of polio in two years and four months. The six-year-old Puerto Rican girl had neither immunization shots nor sips. She came to Miami four months ago from Puerto Rico and apparently contracted the virus here, since the incubation period is about two weeks. She did not attend school.